VANCOUVER - Activists facing off against energy giant Kinder Morgan have been ordered off a Metro Vancouver conservation site by a B.C. Supreme Court judge who also noted the importance of considering citizens' opposition to activities they view as destructive. Associate Chief Justice Austin Cullen granted the company an injunction Friday, saying a group of anti-pipeline protesters must dismantle encampments on Burnaby Mountain by 4 p.m. Monday. "It is, of course, important to consider the defendants' assertions and submissions that what they were engaging in was freedom of expression to address an issue of critical importance," Cullen said in his written ruling. "I am satisfied that as much as the right of the public dissent must be carefully protected, what is at issue in the present case goes beyond that." Five defendants, including two Simon Fraser University professors, and several unnamed supporters have been demonstrating since September around a conservation area that workers were surveying. Lynne Quarmby, who teaches molecular biology and biochemistry at SFU, said she's disappointed in the ruling even as she's still dealing with the "chaos" that erupted in her life after she was served with court documents. "This is really, really hard and I'm determined to do it and I will continue to do it," she said tearfully. "I know that the risk is high but this is really important." However, Quarmby later said she was unsure about whether she will violate the order, adding she's glad the judge noted the importance of freedom of expression in a democracy. Kinder Morgan spokesman Scott Stoness said the company will now determine when work will resume after employees who felt intimated walked off the site. "We support and encourage people expressing themselves," he said. "I think the appropriate protest can happen near where we are but without being in the way of our drilling. "We don't object to them expressing their views but we think it should be done in a safe place, in a safe manner. Certainly, if protesters are using bullhorns right next to our workers that's not safe." "I don't think we anticipated that the level of attention would be as large," he said. "All we're doing is putting two boreholes into the mountain, which when we're done will have very little impact on Burnaby Mountain." Pipeline builder Trans Mountain was granted approval by the National Energy Board to assess the prospective underground route for the $5.4-billion tripling of an existing crude oil passage from Alberta to B.C. for exports to Asia. People across the province, including Vancouver Mayor Gregor Robertson and prominent environmentalist Tzeporah Berman, have posted selfies with mocking scowls dubbed the "Kinder Morgan face." In siding with Kinder Morgan, Cullen listed the "misuse" of the bullhorns, "aggressive and threatening language" and other efforts to block employees from accessing the work site. 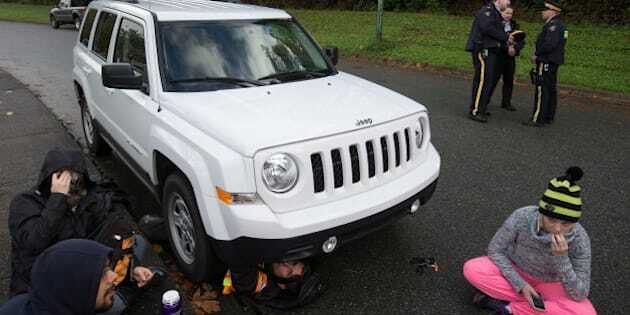 The ruling notes a protester yelled "Nazi" at workers, that another was lying under a vehicle, making it impossible to use, while a third activist blocked workers from putting equipment into the vehicle. "(Workers) were faced with either physical confrontation or retreat," Cullen said. "They wisely chose the latter." However, lawyer Josh Paterson of the BC Civil Liberties Association said Cullen's ruling lacks clarity about how far protesters can go with their freedom of expression. "Calling people names, even horrible names, in the context of an energetic protest is not a threat," he said. The protesters still face a multimillion-dollar civil lawsuit that alleges trespass, assault and intimidation of workers. The City of Burnaby, which also opposes the pipeline project, has asked a federal court to expedite its own appeal of the National Energy Board's permission to conduct the route assessment.